"It now seems quite clear that Earth is not the only inhabited planet." Apart from planets doing a fine job of concentrating and protecting molecules in a certain region, there is another way. Any substance concentrated into reasonable quantities can achieve the same thing. But to have a substance that does not react with the molecules and provides protection or a buffer from the relentless heat and other marauding molecules that want to react can prove extremely helpful. Scientists call this substance a life solvent. From a study of the naturally occurring substances found in space, scientists have identified 9 life solvents. Data from CRC's Handbook of Chemistry and Physics, 70th edition. 1989-90. In terms of the right physical state of the life solvent — liquid, solid or gas — it has to be one that allows a reasonable number of molecules to come together and at the same time permit the molecules free movement through the solvent. With this in mind, we can say with reasonable confidence that the preferred physical state of the life solvent has to be the liquid state. Otherwise if we had a life solvent in its vapour state, this usually means that either the temperature is so high that it prevents fast moving molecules from coming together and sticking properly to form larger molecules, or atmospheric pressure is so low that the probability of small molecules colliding to form larger molecules is slim. On the other hand, chemical reactions between molecules would hardly proceed at all if the solvent was entirely in its solid state. A liquid is therefore the preferred physical state. To ensure any life solvent remains in the liquid state, you need to provide just enough heat. Thus, temperature is another important factor in the development of life. We define temperature as a measure of the quality (i.e. frequency) and quantity of electromagnetic radiation permeating a given region. Generally the more radiation there is occupying a specified region of space and the higher the frequency of that radiation, the hotter the region (i.e. the higher the temperature) gets. Is there heat in the universe? The universe might be a very cold place. But luckily the universe is lavishly peppered with many types of hot cosmic campfires we call stars, and the internal heat generated by the hot molten rocks inside planets. Thus a life solvent can't be too cold, otherwise life is unlikely to emerge and grow to any reasonably advanced level. A classic example of this would have to be Titan, a moon of Saturn. Now this is a bitterly cold world. Since the ground level temperature is -178°C coexisting with a pressure of 1.5 times greater than that on Earth, it has been theorised that solid, liquid and gaseous methane exists like water does on Earth. However, despite the presence of a liquid life solvent—methane—the chance of finding life on Titan is extremely remote. The exceedingly cold temperatures on the moon's surface may be unable to stimulate a great deal of chemical activity for life to develop, let along evolve to any reasonable level of complexity. To ensure life emerges and evolves to a certain level of complexity and intelligence at a reasonably rapid pace, the temperature has to be just high enough for chemical activity to take place. Likewise, the temperature cannot be too high as to cause the life solvent to turn into a gas. Or else the molecules will have a hard time sticking together with other molecules. For example, in Roman mythology, Venus was the name given to the immortal goddess of love. But there is nothing romantic about the place we call Venus. This is a hellishly hot planetary world. The surface temperature of 475°C is so hot that all surface water has literally evaporated. If any life could survive on Venus today, it would have to be exceedingly small and hidden deep underground. The reason for the high temperatures is not so much because it is the second closest planet to the Sun, but mainly as a consequence of its thick carbon dioxide atmosphere trapping the heat from the Sun and creating what scientists call a super-greenhouse effect. "We think that life may have started on Venus. But the planet was a little more hostile than Earth, and early life didn't develop far enough to absorb the carbon dioxide being spouted by all those volcanoes. So then [as the Sun grew brighter] the super-greenhouse effect got rid of the oceans by heating them; the hydrogen component of water escaped through the atmosphere, and the oxygen component got trapped in the rocks as mineral oxides. Naturally the primitive little lifeforms died off." The aim is to keep a balance in the temperature. Neither too hot, nor too cold. With this information in mind, the optimum liquid life solvent must be one that can remain liquid over a wide temperature range with a particular emphasis on being sufficiently warm as needed for the development and evolution of life to proceed at a rapid pace. 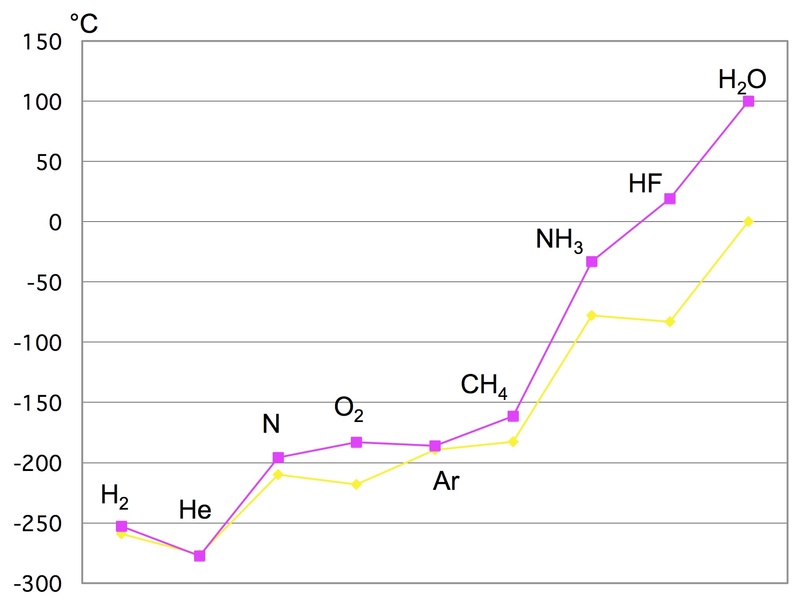 If we refer to the graph of melting (yellow) and boiling (purple) points of the various life solvents (see above), we see at least four substances considered to be good examples of a life solvent — methane, ammonia, water and hydrogen fluoride. However, only liquid water has the high enough temperature needed for the development and evolution of life to proceed at a reasonably rapid pace. We should not be surprised by this finding. If you imagine it, nearly 4.5 billion years ago, the Earth's surface was a hot a hellish place. It was covered with a thick atmosphere saturated with water vapour released from the interior of the planet and mostly from icy comets plunging to the Earth's surface. As the Earth cooled to form the crust, water vapour became the first life solvent to liquefy to form the oceans of the world simply because water has the highest boiling point of all the life solvents. The same would be true among all the other planets and their moons in our solar system and, by implications, on planets in other solar systems. Does this mean life can never develop and evolve in another liquid life solvent? No. However, the evidence has been lacking to support the development or emergence of life in other life solvents. And possibly for good reason too. While it is feasible for other life solvents to liquefy in a much colder environment, the consensus among the scientists is that chemical reactions that must proceed in them for life to arise would probably be too sluggish to be of significance, unless a catalyst is present. Unfortunately, so far no such catalyst has been found in the laboratory or in nature that can speed up the process at such low temperatures. Why does water withstand a higher temperature range than all the other life solvents? The secret lies in the curious inherent yet subtle electrostatic property of water which allows it to attract many other molecules including itself without allowing the force of attraction to be too strong as to solidify at room temperature or to create a chemical reaction. To understand this property well, we need to look more closely at the physical structure of the humble water molecule. When two hydrogen atoms, each carrying one negatively charged particle called an electron, attaches to an oxygen atom to form water, the electron of each hydrogen atom gets used in the formation of a very strong chemical bond between the hydrogen and oxygen atoms. The result is a slightly positive charge at the electron-depleted hydrogen end facing away from the molecule. 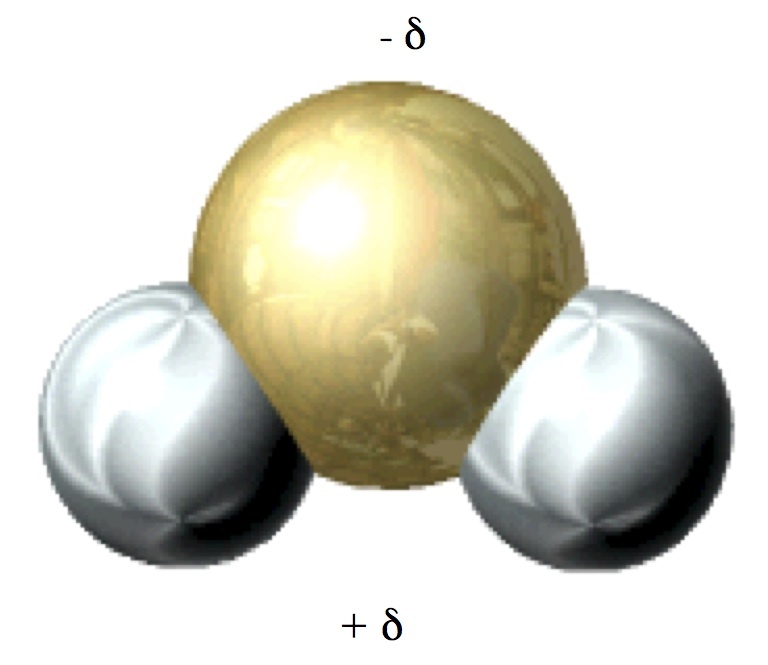 As for the oxygen atom, it now carries a slightly negative charge due to the presence of the extra electrons. The consequence of this slightly weak electrical charge at opposite ends of the molecule is a weak dipole responsible for giving water its special property. You see, unlike charges attract, therefore, water has the uncanny ability of electrostatically-attracting a wide range of molecules, including itself. And if, for any reason, it cannot attract certain types of molecules in an electrical sense, certainly the shear bulk of the water available on the surface of some planets can help to gravitationally attract them instead. Due to this weak dipole, water ensures it doesn't immediately turn into a solid between 0 and 100°C. The bond formed by the weak electric charge between water molecules is not strong enough to create a very rigid chemical bond like the one between the hydrogen and oxygen atoms inside a water molecule. The water can be agitated just enough between 0 and 100°C by electromagnetic radiation coming mainly from the Sun or internally from a planet to keep it in the liquid phase. But at the same time, the electric charge is strong enough to hold water together at higher temperatures. This is why the boiling point of water is so high: the electrostatic attraction between water molecules keeps it together even at reasonably high temperatures. Thus as the planet cools, the high temperature range of the liquid phase for water above all the other life solvents is enough for the development and evolution of life to proceed at a reasonably rapid pace in water. So don't be too surprised if we find ETs depending on water for their survival and evolution just as we do. If we wish to find ETs and DNA-like molecules, no matter how primitive they might be, we must go where the water is. Is there liquid water outside the Earth? "We have the smoking gun." Well, actually, a number of moons in the solar system and the planet Mars have liquid water. That's not new. What is new is how close this liquid water is to the surface of such a tiny world and how much of it is likely to be in the liquid state for a long period of time. "Other moons in the solar system have liquid-water oceans covered by kilometers of icy crust. What's different here is that pockets of liquid water may be no more than tens of meters below the surface." ""This is a radical conclusion - that we may have evidence for liquid water within a body so small and so cold. However, if we are right, we have significantly broadened the diversity of solar system environments where we might possibly have conditions suitable for living organisms. It doesn't get any more exciting than this." "We previously knew of at most three places where active volcanism exists: Jupiter's moon Io, Earth, and possibly Neptune's moon Triton. Cassini changed all that, making Enceladus the latest member of this very exclusive club, and one of the most exciting places in the solar system." "As Cassini approached Saturn, we discovered the Saturnian system is filled with oxygen atoms. At the time we had no idea where the oxygen was coming from," said Candy Hansen, Cassini scientist at NASA's Jet Propulsion Laboratory in Pasadena, Calif. "Now we know Enceladus is spewing out water molecules, which break down into oxygen and hydrogen." "There's no question, along with the moon Titan, Enceladus should be a very high priority for us. Saturn has given us two exciting worlds to explore," said Jonathan Lunine, a Cassini team member at the University of Arizona in Tucson, USA. But has there been enough time for the internal heat responsible for melting the water to above 0°C to be maintained long enough to permit the development of primitive life? Or is the heat more to do with some kind of recent gravitational tug by Saturn or the other neighbouring moons (or even a collision with something)? So far, Spencer is hedging his bet on tidal heating from the gravitational pull of nearby Saturn. As Spencer said, "We think we can rule out a radioactive-related source." "Any life that existed could not be luxuriant and would have to deal with low temperatures, feeble metabolic energy, and perhaps a severe chemical environment. Nevertheless, we cannot discount the possibility that Enceladus may be life's distant outpost." More details can be found in the 10 March 2006 edition of Science (Vol.311, No.5766, p.1388). This brings us to the next important factor in the development of life in the universe: time. Temperature is one thing. But how much time can we give to life at the right temperature? In other words, how long can the life solvent remain in the liquid state over some region of a planet. There is clearly an optimum temperature range needed for life to develop and grow, and it has to be maintained for a long time. This implies an upper and lower limit to how much radiation life can tolerate. For example, at one extreme, if molecules are not sufficiently protected from the radiation, they will not proceed towards a path of increasing order and complexity. What happens is that when there is too much high-frequency radiation in the environment, the molecules are forced to absorb this excess energy through an increase in their vibrational, rotational and translational motions. However, such motions will increase the chances of an eventual breakdown of the molecules' elaborate structures and thus reducing their lifespans. Simple molecules will only congregate to form more complex chemical structures if sufficient protection from the relentless radiation is provided. On the other extreme, not enough radiation of a high enough frequency can create problems for the development and evolution of life as well. If there is not enough radiation to help agitate the molecules and break the occasional chemical bonds holding atoms together, the formation of larger chemical structures simply cannot take place. The temperature for life to exist within a liquid life solvent must be just right. Can the temperature be optimised and maintained for long enough to allow life to develop and evolve to a reasonable level of complexity? Yes it can. It depends on where the heat is coming from. At the present moment, the best sources of heat can come either from the planet's interior through hot molten rock, or from the parent star. Did Mars rely on its own internal heating? As of 24 February 2005 one scientist has boldly suggested there could be microbial life living deep underground on the surface of Mars not far from the hot molten rock in the planet's interior. According to Professor Vittorio Formisano at the Institute of Physics and Interplanetary Space in Rome, Italy, the orbiting Mars Express spacecraft from the European Space Agency has discovered the presence of methane and copious amounts of formaldehyde being released from pocketed regions around the planet's equator. The evidence was obtained through spectroscopic analysis of the light reflected off the Martian surface using an instrument called the Planetary Fourier Spectrometer (PFS), which was attached to the Mars Express spacecraft. Because the surface appears to be devoid of the source for these gases (since the soil is made of oxidised minerals and in some places traces of water), Formisano is of the view these gases must be coming from beneath the surface. Then Formisano realised methane can be converted into formaldehyde as the methane passes through the oxidised minerals in the Martian soils. If methane can be converted into formaldehyde, the possibility exists for a greater quantity of methane to be present deep underground. But where is all this methane coming from? Scientists are not quite sure. Either there is underground volcanic activity emitting the gas, or very hungry and flatulent microbial ETs are carving out a harsh existence on this inhospitable world. To add extra weight to this view, Formisano noticed how NASA's Mars Odyssey spacecraft is picking up methane and formaldehyde in specific regions of the planet rather than the gases being distributed evenly throughout the planet. And the location of these gases seem to coincide with the presence of water on the surface. The Phoenix lander exploring Mars on 31 July 2008 has officially confirmed water does exist after analysis of soil on the planet. University of Arizona scientist Peter Smith, Phoenix's principal investigator, said the ice being analysed by the lander will help scientists to determine whether Mars could have supported life at some point in its long geological history. "We're looking to understand the history of the ice, by trying to figure out if this ice has ever melted, and through melting has created a liquid environment that modifies soil," Smith said. "We're just getting the data back. Through this we also hope to resolve questions, is this a habitable zone on Mars, meaning that we have periodic liquid water, materials that are the basic ingredients for lifeforms." Now the evidence for water existing in liquid form and in vast quantities capable of modifying the Martian landscape at a time when the planet was much warmer and wetter has reached fever pitch after researchers at the University of Colorado at Boulder noticed from a high resolution imaging camera aboard the Mars Reconnaissance Orbiter the existence of a 50-kilometre wide and 1,500-feet deep canyon carved out by water, ending in a delta where sediments were deposited to form an ancient lake bed. The lake is part of the Holden crater located in the much larger valley known as the Shalbatana Vallis within the Holden basin (formed by a larger and older impact). There is also evidence part of the crater rim collapsed to form a second lake. And there is fine sediment deposited in the lake bed looking like clay. ""The origin of the clays is uncertain, but clays in the probable lake sediments implies quiescent conditions that may preserve signatures of a past habitable environment. If we were looking on Earth for an environment that preserves signatures related to habitability, this is one of the kinds of environments we would look at." The presence of this lake system with its interesting clay material suggests water may have continued to flow on the surface at least 300 million years beyond the expected warm and wet period of the planet's early geological history. Either that or another impact had formed the Holden crater where it released frozen water beneath the surface to flow and eventually disappear after several thousand years in the feeble Martian atmosphere and low gravity. If the latter situation is true, the water is likely to be present to this day below the surface, seeping in the liquid form to the surface periodically with the Martian seasons before turning to ice and eventually vapour in the cold and low pressure atmospheric environment. In further support of a long-lived ancient lake system that was once filled with water on Mars is another image showing the clearest evidence yet of shorelines. "Not only does this research prove there was a long-lived lake system on Mars, but we can see that the lake formed after the warm, wet period is thought to have dissipated." "On Earth, deltas and lakes are excellent collectors and preservers of signs of past life. If life ever arose on Mars, deltas may be the key to unlocking Mars" biological past." With the chances of finding liquid water in the past looking very promising, are we likely to find genuine Martian life still carving out a harsh existence where water and methane are present today? Well, if Mars does have life as we speak, we can only hope it isn't part of our Earthly microbial life contaminating Mars after our several visits to the planet. The last thing scientists want to do is get excited in finding life on Mars but become perplexed about why the DNA of supposedly Martian life look incredibly like those on Earth. Will future scientists claim life on Earth came from Mars? In other words, we are the Martians! Or is it that NASA scientists have left a few Earthly microbes on the planet from their probes and so effectively stopped us from finding out with one hundred percent certainty the existence of ETs? "...formaldehyde in the Martian atmosphere does not last...for long. Does not last one year or two years or ten hundred years but only 7.5 hours. And this is...tremendous because the impact is that you need continuous, strong production of formaldehyde." For this to happen, we are left with no choice but to find a more stable source of long-term heat and light outside the planetary surface. This heat source is best provided by a neighbouring star. Quote obtained from ABC's Catalyst program, 24 February 2005. Quotes from members of the Phoenix lander team obtained from https://www.nasa.gov/mission_pages/phoenix/news/phoenix-20080731.html. Quotes from researchers of the University of Colorado study team obtained from http://www.reuters.com/article/us-mars-lake-idUSTRE55G74R20090618.